Note that sending information is a manual, one-time affair: each time you want to send a Look or a Dashboard to someone you need to click Send and fill out the information in the dialog box. If you find yourself repeatedly sending the same information to the same people, you might consider scheduling the Look or Dashboard instead. The title of the report being sent. By default, Customer Insights uses the title of the Dashboard or Look as the report title. However, you have the option of entering a custom report title. If your Look is entitled DemoRptJan18 you can title the report emailed to people Demographics Report for January 2018. That’s entirely up to you. In that case, the emailed report will only include data for December 25, 2017, regardless of how many days’ worth of data the Look is capable of retrieving. And yes, you can remove yourself: even though yours is the default recipient address, you do not have to receive a copy of the report. The scheduling dialog box also gives you the opportunity to select the Run schedule as recipient option. 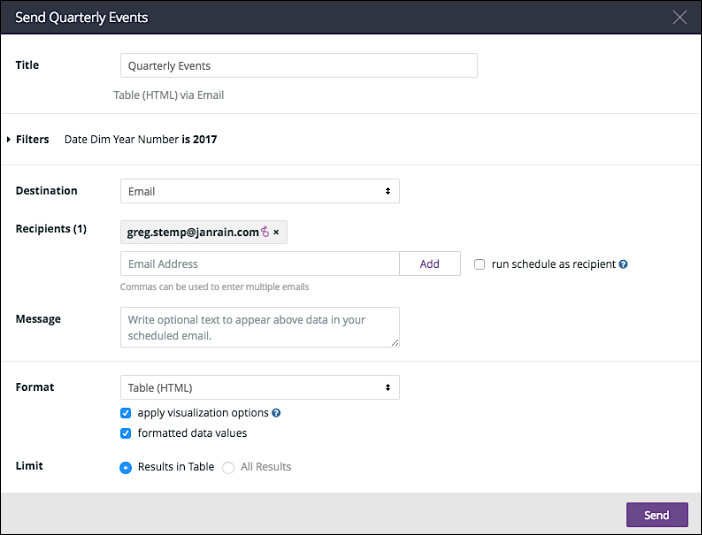 With this option, the query used to retrieve Dashboard data is run using any access filters and attributes that have been applied to individual user accounts (based on email address). That means that users will get the same report but, depending on those filters, could receive different datasets. Note. By default, Customer Insights does not let you set access levels on individual data fields: if a user has access to report A, then he or she had access to all the information found on that report. If you need finer-grained access controls, contact your Akamai representative. Users with a purple icon are registered users; users without this icon are not registered users. However, this restriction applies only to running schedules as recipients. If you do not enable this option reports can be sent to anyone. TXT (tab-separated values). Plain text file with data fields separated by tabs. Excel Spreadsheet (Excel 2007 or later). With this option, the report includes the raw data, but does not include any visualizations options such as row color. CSV. Plain text file with data fields separated by commas. If a field contains a comma (for example, January 1, 2018) that field will be enclosed in double quote marks: “January 1, 2018”. HTML. The report is returned as an HTML file, formatted to match the format of the visualization. Markdown. The report is returned as an unformatted table using the Markdown markup language. PNG (Image of Visualization). The report consists of a “snapshot” of the visualization. Data can be viewed, but cannot be manipulated. If you choose HTML or PNG, emailed report data is sent inline as part of the email body. If you choose one of the other formats, emailed report data is as an attachment. 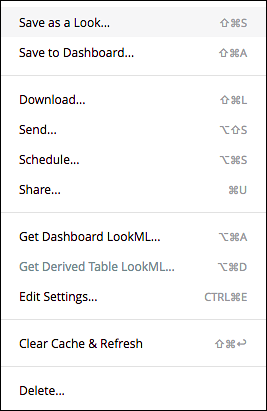 If this option is not selected, data is returned without applying table chart visualization settings. Formatted: Data is returned after applying numeric formats. This is the default value. Unformatted: Data is returned in its raw, unformatted state. This option typically applies to table calculations. Results in Table. The reports file contains the same number of rows specified in the visualization. If the visualization only allows 300 rows the downloaded file will only include 300 rows. All Results. Returns all the rows returned by the query; this will often be more rows than specified by the Look. Note that the All Results will not be available depending on such things as the size and complexity of the query, and whether the query includes “add-ons” like row totals or table calculations. This option should be selected only if you are sure that the resulting report will not tie up the network and/or your local computer.